For the third consecutive year, Buchanan’s Whisky is the official spirits sponsor of the Billboard Latin Music Awards that will take place in Miami on Thursday, April 27. In order to celebrate the iconic award show and the greatness of Latin music, Buchanan’s has created an ideal cocktail choice in the Sugarcane inspired by Miami’s local flare. Paired with the smoothness and fruity flavors of Buchanan’s DeLuxe, a 12 year old blend, the evening’s signature cocktail, made with cane sugar and lemon juice, is perfectly reflective of Miami’s tropical setting. As the stars will also be enjoying the cocktail at a variety of events throughout the awards week, Sugarcane is the perfect option to toast with family and friends to the nominees’ success and to honor the most popular albums, songs, and performers in Latin music. J Balvin, who is nominated for seven Billboard Latin Music awards this year, including the prestigious Artist of the Year, recently partnered with Buchanan’s for the Es Nuestro Momento campaign, which empowers a new generation of Latinos with the belief that cultural pride is key to unlocking greatness. In order to inspire individuals to pursue their passions and celebrate their achievements, J Balvin and Buchanan’s launched a contest to help find the next big musical talent. J Balvin released a new song titled “Es Nuestro Momento” and gave aspiring musicians the opportunity to use his acapella vocals to create their own version of “Featuring J Balvin.” Today, J Balvin announced via Facebook that Leonel Vargas has won the contest and the exciting opportunity to travel to Miami to attend the awards’ ceremony. Visit EsNuestroMomento.com to listen to the unique and fun winning track. The Billboard Latin Music Awards will be televised live at 7:00 p.m. Make sure you tune in while enjoying a Sugarcane! 1. Combine Buchanan’s DeLuxe, cane sugar juice, and lemon juice in a cocktail shaker and shake well. 2. 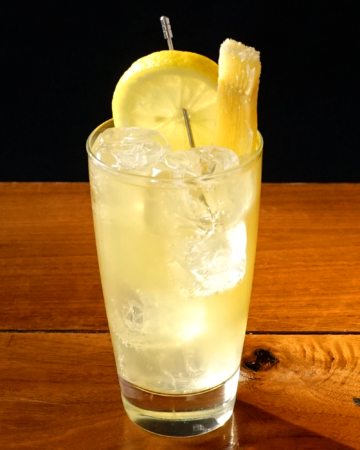 Strain into a highball glass with ice. 4. Garnish with a piece of cane sugar piece and a lemon wedge. Yield: 1 drink, no drink contains more than 0.6 fluid ounces of alcohol.